When you start looking , and or shopping for a professional grade drawing tablet, you absolutely must take a look at the Wacom Cintiq 24hd Touch. 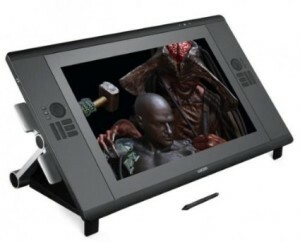 This is one of the best professional Drawing Tablets that you are likely to find. If you are looking for a touch screen drawing tablet, I definitely urge you to take a closer look at the Cintiq 24hd touch. This Digital Drawing Pad can be adjusted to a variety of different angles so the user can work in a comfortable position for long periods of time. The 24 hd touch can be made to lay almost flat, if you want to be directly above your work area looking down on the screen, or it can be configured to hang out over the edge of your desk so you can sit comfortably in front of it while you work. When you are working, you will like the fact that the interface buttons are large and arranged so that they are easy to reach, and touch. Although the dth 2400 does have a fairly large footprint on your desk, this is overcome by the fact that you can adjust it to so many different positions.